years. I am looking forward to the change, but I really am going to miss this place. So many memories. What I will miss most is my kitchen. We are kitchen people, feels like the heart of a home is in the kitchen, doesn't it? My kids are constantly with me while I'm cooking, and it feels like they've grown up sitting on top of our kitchen counter "helping" me. That I will miss. I will even miss all of the things that annoyed me about this place. Thankfully we have all of our memories and are moving on to something we have been wanting for a very long time. Goodbye 49. On to the crafting! I can start by saying that I am reading nothing at the moment. I'm either packing or knitting, reading is on hold at the moment. I have two projects on my kneedles and hook at the moment. 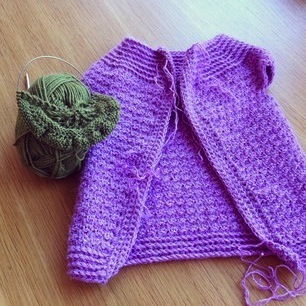 I'm almost done with Esther's cardigan, just have the sleeves left and need to tuck away loose threads. I love the way it turning out! I should be done with it this week if packing and unpacking doesn't take up all my free time. I started another project just this morning, a "Dinner in the Eiffel Tower" shawl. I've never knit a shawl and have wanted to make myself one for a long time, but that will have to wait. This shawl is a present for the sweetest, warmest daycare teacher ever. She is starting a new job and will be leaving the daycare my kids go to in mid-April. I cried a little when I got the news, she is just that precious. She has so much patience, oozes warmth and caring and you can tell that she really loves the children she teaches. She and I have come to know each other quite well throughout the years and she has helped me a lot with my sensitive little boy. She gets him, knows how he works and can appreciate his sensitive, careful nature and gives him the gentle nudges he needs to take on scary things. I really want her to know how much she has meant to this family, and I'm hoping this little gift will be a reminder of us and how much we appreciate her. As for the shawl itself, I'm not sure about the yarn. It's 100% wool and feels so coarse and chunky. I usually knit in blends of alpaca and wool. Might just be my knitting, I'm a stressed person at heart I guess and I knit HARD. I'm trying to be as relaxed as possible, surely a challenge for me! I'll give the yarn a chance, I would like to use it since my son chose the color for his teacher. We'll see how this evolves. 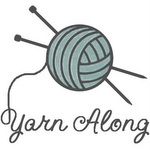 Joining Ginny and a whole lot of crafty souls over at Small Things. Mother of two living in mid-Sweden. I love knitting, crochet, cooking and baking. Give me a cup of coffee (or two) to enjoy in peace and I'm in heaven. I'm easy to please, it's all about the little things in life. © 2010-2013 Simply Green. Please do not copy or take images or content without my permission.